There is only one word to describe these Greek inspired shrimp - Nostima (delicious)! I loved the richness of the flavours and spices in this dish. Give it a try, you'll love it. Enjoy! 1. Preheat oven to 375°F with rack in middle. 2. Cook onion and garlic in oil with 1/4 teaspoon salt in a 4-quart heavy saucepan over medium heat until softened, about 5 minutes. Stir in spices and cook, stirring, 30 seconds. Add chopped tomatoes with juice and sugar and simmer, uncovered, stirring occasionally, until slightly thickened, about 20 minutes. Remove from heat. 3. Season shrimp with 1/8 teaspoon salt, then stir into tomato sauce. Transfer to a 2-quart shallow baking dish and top with feta and olives. Bake until just cooked through, 18 to 20 minutes. Serve sprinkled with oregano. I love your blog! 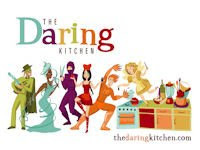 Your recipes are amazing and your photography is stunning. Why doesn't the whole world know about you yet? Look at those shrimps! I wish I could scoop it up with my hands. Oh, yummy! It's 7am and I'm already drooling!!! I was hesitating when I saw this recipe on Epicurous. Since you made it, it must be delicious. Thanks for sharing! Shrimp, feta and kalamata olives - you can't get any better than that. Gorgeous photos too. Wow. Holy cow, does this ever look deliicous, love the greek flavors combined with the shrimp, absolute perfection! Awesome flavors, this looks amazing! Delicious preparation for the shrimp, great flavors! Dragon, you're hitting upon alot of Greek falvours here...all bundled around sweet and succulent shrimp. I think you're my honourary Greek for the time being! Kali Orexi! man that sounds so good. I would devour this in no time. I love a baked shrimp dish! What intriguing flavours, I am loving the cinnamon and allspice. Yum!! I made something similar recently but it didn't have as many ingredients. I love the cinnamon and allspice, it sounds so interesting! YUM! Looks delicious. I love Greek flavorings. What a great dish - I love all the spices and shrimp and feta! It would disappear quickly at our place. This dish looks so good! I love eating shrimp cooked different ways. Love the addition of cinammon! That looks fantastic. And I bet it smells wonderful cooking. This looks amazingly mouth-watering! I am imagining this with some garlic naan. yum yum! This looks amazing! I adore all of these flavors and putting them together in the little ramekins looks like it would taste fabulous! And something all of us would love! This looks great and such a different twist on a summer favorite. 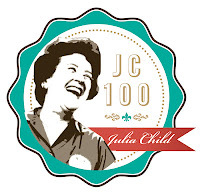 Thanks for the great inspiration and the delectable photos! That looks amazing... just my kind of food. I'm going to try the recipe this weekend! This shrimp bake looks fantastic. I'm a huge shrimp fan, and anytime you pair it with the word "bake," I know it's got to be a great dish. Love your blog! Can't wait to keep reading more. Oh wow, I can only imagine how it taste and that would be DELICIOUS! It's like you were reading my mind! 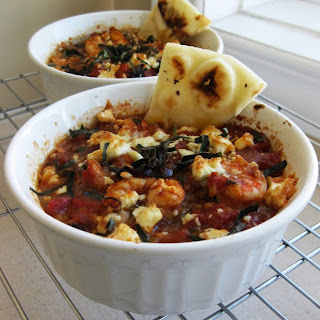 I was looking for a baked shrimp and feta dish so I new this was the recipe I wanted to try. I'm so happy I did because it was fantastic! I loved the spice combination. Really, really great dish. 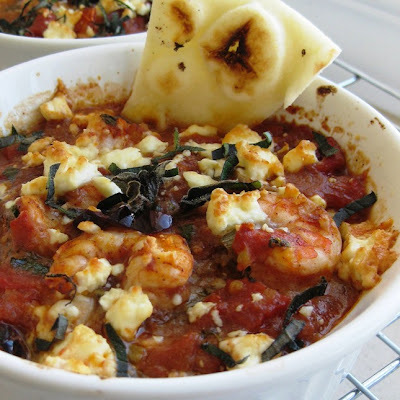 Tomato and feta baked shrimp dishes like this are so good! I am such a sucker for shrimp. This looks like a lip smacking goodness. Love your place around here! This. looks. amazing. SAVE SAVE SAVE. Gotta get some allspice and feta tonight. This is perfect for a dinner party I'm throwing--and if I use individual ramekins, very cute as well!! Thanks!